I heard Joe Summers at Sylvio's and was enchanted with his talent. He will delight us with his Django Reinhardt style music. Hope to see you there. Guitar virtuoso Joe Summers leads this caravan inspired by Europe’s most famous Gypsy, Django Reinhardt. 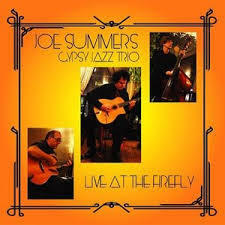 With two guitars and an upright acoustic bass, Joe Summers Gypsy Jazz Trio delivers beautifully improvised jazz reverent of the ’20s and ’30s that is punctuated by energetic, tight melodies and strong beats. Come enjoy a community favorite! This will be a way to feel like we are in France that evening. Si tu veux assessoir/danser ensemble, txt-moi a 734-649-4192...Je suis ici d'habitude chaque nuit!